Police say stabbing of officer in Netanya most likely act of terror. Suspect shot and neutralized. Israel Police say the stabbing of an officer in the coastal city of Netanya Tuesday morning was likely an act of terror. "The initial findings show that the motive of the attack was, apparently, nationalistic," a police spokesperson wrote. 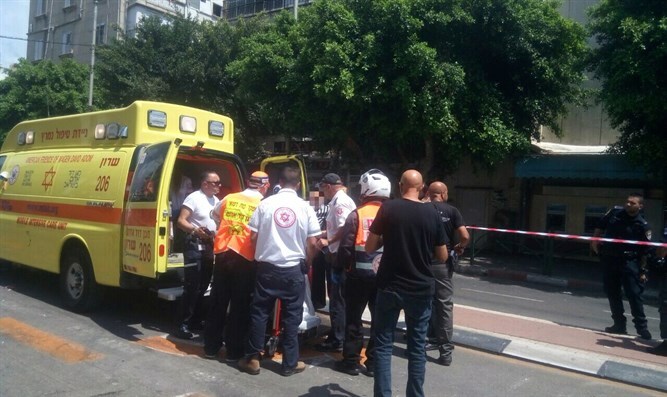 The officer, roughly 26-years old, was stabbed in the neck and lightly wounded on Herzl Street in central Netanya at roughly 10:45 a.m.
MDA emergency first responders were called to the scene and treated the wounded officer. Authorities say the attacker was shot and neutralized during the attack. The assailant is reportedly in moderate condition and has been taken into custody. The wounded officer’s condition has been listed as light. Both the wounded officer and his attacker have been evacuated to the hospital for treatment. MDA paramedic, Yaki Hagag described the scene of the attack. "When we arrived on the scene, we identified a 26-year old male who was fully conscious and suffered from a stab wound in his neck. We provided him with preliminary medical treatment on the scene and evacuated him to Laniado Hospital in light condition. The attacker was laying on the sidewalk nearby. He sustained a wound to his upper extremities and following preliminary medical treatment on the scene, we evacuated him to a hospital."